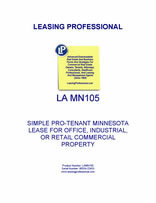 This form is for a single tenant Minnesota lease where the tenant has superior leverage. It gives the tenant the right to use the premises for "any legal use," and has very abbreviated remedies for the landlord in the event of a tenant default. It is also pro-tenant in character because of the clauses it does not contain which customarily appear in pro-landlord forms relating to remedies and a variety of other pro-landlord provisions. 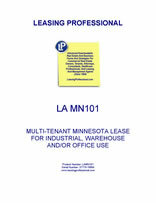 This form is for a Minnesota industrial lease suitable for industrial, warehouse, and office uses in a multitenant building. Despite the comprehensive definition of operating expenses under the lease, no fewer than 23 pro-tenant exclusions to operating costs are also contained in the lease, making for a balanced approach to the tenant's operating expense obligations. Several exhibits are included (see details below) including one for fair market value renewal options and one for expansion rights for additional space in the building.